Loads are transferred between structures and soils principally through contact of surfaces. The nature of this contact can dramatically affect the overall load capacity of a structure and therefore plays a key role in civil engineering design. In geotechnical analysis, soil-structure interaction is traditionally modelled using a simplified boundary condition or by employing interface elements. In the former, prescribed loads are often used to model flexible structures while prescribed displacements can be used to simulate a completely rigid structure. These crude simplifications often lead to inaccurate predictions of the real behaviour, and are only possible when the surfaces are always in contact and their locations are known a priori. Interface (or joint) elements were initially developed for rock joints, and typically use normal and tangential stiffness to model the pressure transfer and friction at the interface. Because they have to be predefined and their topology remains unchanged with time, they are suitable only for predefined interfaces with small deformations. For problems such as pile installation, penetration tests and anchored retaining walls, the soil-structure interfaces undergo large deformation, frictional sliding, surface separation and re-closure, and are highly variable during the loading procedure. These interfaces cannot be modelled properly using simplified boundary conditions or traditional interface elements. A more rigorous approach, to tackle such problems, is to consider the contact constraint kinematics at the interface. The aim of this research program is to tackle the problem of soil-structure interaction at large deformation using the latest algorithms in computational mechanics; namely (1) the Arbitrary Lagrangian-Eulerian (ALE) method for large deformation and (2) computational contact mechanics formulations for the soil-structure interaction. One of the main challenges in dealing with large deformation problems is the severe mesh distortion. This is particularly true for deep penetration problems like pile installation. 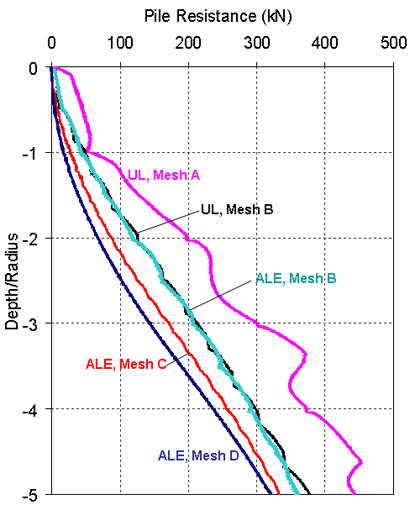 The ALE method tackles the problem by separating the mesh displacements from the material displacements so that the mesh remains optimal during the loading procedure. 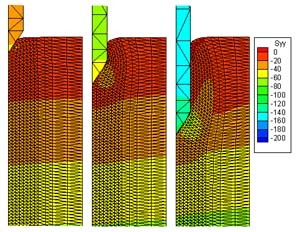 Very recently, the Geotechnical group (Nazem, Sheng and Carter, IJNME, 2006) has developed novel numerical algorithms for handling mesh motion and stress integration in an ALE method. These algorithms are very fast and robust and have proved to be very effective in modelling the installation of single axial piles in dry soils (Sheng, Sloan and Carter, IJNAMG, 2006). Significant research effort is still needed to further develop these algorithms for saturated/unsaturated soils, dynamic loading and pile groups. 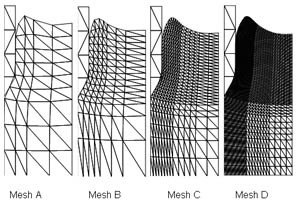 One of the main challenges in dealing with large deformation problems is the severe mesh distortion. This is particularly true for deep penetration problems like pile installation. 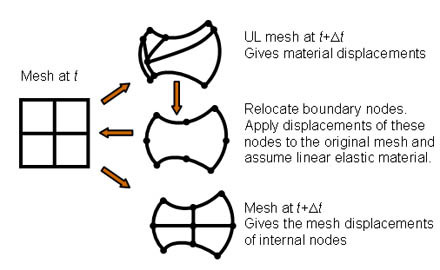 The ALE method tackles the problem by separating the mesh displacements from the material displacements so that the mesh remains optimal during the loading procedure. Very recently, the Geotechnical group (Nazem, Sheng and Carter, IJNME, 2006) has developed novel numerical algorithms for handling mesh motion and stress integration in an ALE method. These algorithms are very fast and robust and have proved to be very effective in modelling the installation of single axial piles in dry soils (Sheng, Sloan and Carter, IJNAMG, 2006). Significant research effort is still needed to further develop these algorithms for saturated/unsaturated soils, dynamic loading and pile groups. Problems which involve frictional contact are very challenging to solve using the conventional finite element method. Frictionless contact is characterised by non-smooth contact constraints (no tensile contact forces and no forces on open gaps). The introduction of friction adds to these difficulties with non-smooth shear force-displacement relations. For non-smooth, non-local frictional contact at soil-structure interfaces, merely achieving convergence can be a very difficult task. In addition, the sudden change of the normal directions along the structural surfaces (at corners or vertices) can cause oscillation in the computed contact forces and lead to another source of divergence. A automatic Newton-Raphson scheme for load stepping.